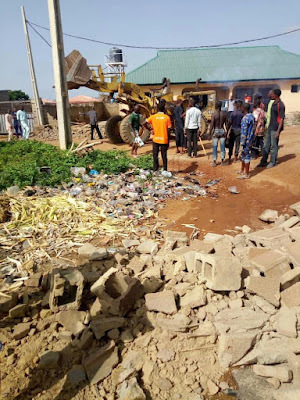 Few minutes back news rocking the air that Kwara State Government demolished a house that belongs to a gubernatorial aspirant under the umbrella of the Peoples Democratic Party (PDP) Alh. Lukman Olayiwola Mustapha in Sango area of Ilorin. Information reaching Kwarareporters have it that the news is untrue. "I will only advice the bloggers and news carriers to be careful of blaming the constituted authority". "I was involved in the case from day one till the end. The demolition is between the original land owners and the allottees. Though the role played by the government too is somehow". "The demolition is not done by kwara State government but the original land owners. Let's be mindful of what we write". Also the Special Adviser on Media to the Kwara State Government Dr Muhydeen Akorede said "The Kwara State Government has nothing to do with the reported demolishing of houses at Zango area of Ilorin. We understand the incident is the outcome of a civil dispute. As late as yesterday, the government tried to broker peace between the parties". "I have spoken to Mallam Lukman Mustapha on this minutes ago and he is aware KWSG has nothing to do with the demolition". "It's a shame if those young people seeking reform of Kwara State use falsehood and misinformation as tools".